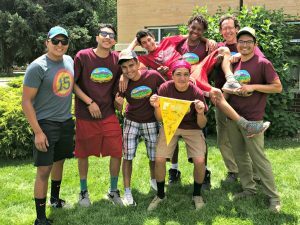 This summer Big City Mountaineers had the opportunity to work with an incredible group of teens who are part of a youth agency called College Track. The College Track partnership with BCM allowed students to learn in a classroom they’ve never before been exposed to – the Holy Cross Wilderness in the backcountry of Colorado! One of the participants was a student named Hector. His agency leader, Lance, recalls Hector as a shy and somewhat reserved student who moved to the United States just over a year ago. Hector spent the previous year practicing English and desiring, just as any teenager would, to make new friendships and fit into his new home. Along with improving his English, Hector taught himself a new set of skills to use as an icebreaker when trying to create new friendships. He learned how to play guitar, taught himself magic tricks, and acquired seemingly endless jokes to entertain others in an attempt to break down barriers to meeting new people. It’s really beautiful up here. I need to tell people about it. On this BCM expedition it was clear that Hector had come full circle. His desire for friendship, and hard work in attempting to create those deep connections, were rewarded as he became viewed as the ‘heart of the group.’ This was a new side of Hector that Lance had never seen. 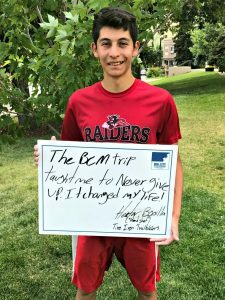 Hector left the backcountry with nine new friends and, in his own words, a life changing experience.